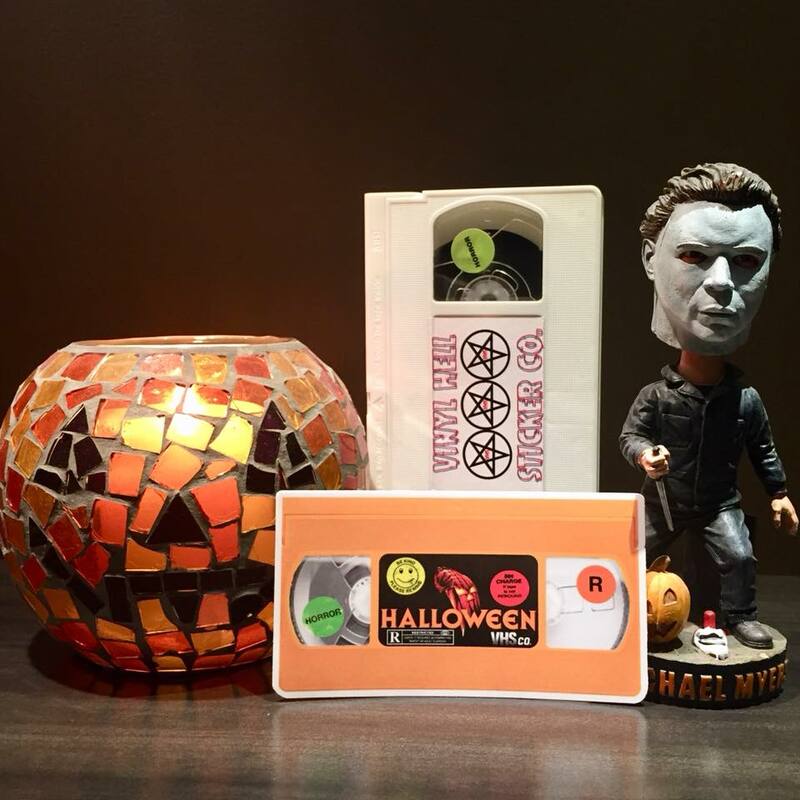 The Vinyl Hell Sticker Co. is a small side venture business for horror fanatic Rob Muir, who gets the word out using social media marketing to show off his company’s line of VHS-inspired, high-quality, vibrant VIDEO VINYL STICKERS . “I’m a huge horror fan and collector of all formats and Cult and Terror film merch and memorabilia,” says Muir. “It has never been easy dealing with cross border drama which includes customs costs, inflated postage and import fees so I wanted to try and create something for us Canucks north of the border to eliminate some of the obstacles we face on the daily. In recent months I got deep into collecting horror and film enamel pins and patches and wanted to enter the arena with something similar or at least comparative to that universe but wanted to do it on the cheap. “I started by brainstorming ideas using our Facebook group name and logos and other inspirations from the community,” he continues, “but kept landing on proper brands and franchises that we all love and at its core the era and retro nostalgia most of us commonly live and breathe – the horror and genre films of our collective youth. 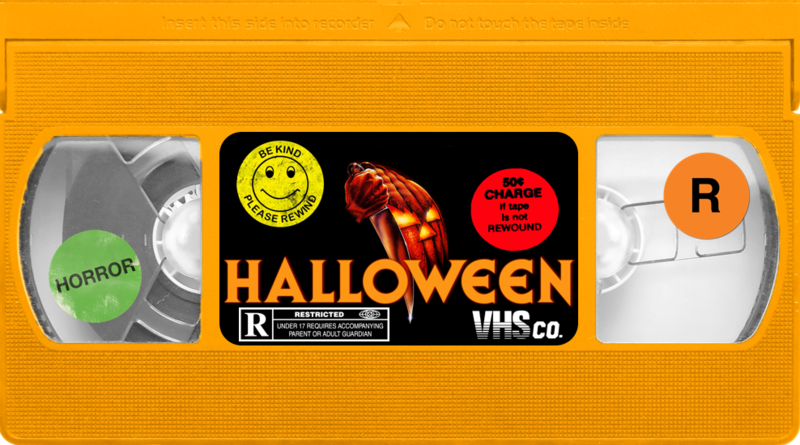 VHS kept coming up as an inspiration or anchor from many of our collector roots and as much as I am a disc guy, I will always fondly recall where it all began for me and that was video”. Muir’s first set of Video Vinyl Stickers, which were unleashed at Shock Stock 2018 are are now sold out in Canada, included stickers from horror classics such as The Exorcist, Dawn of the Dead, John Carpenter’s Halloween and The Thing, Nightmare on Elm Street, The Texas Chainsaw Massacre and cult classics Return of the Living Dead and The Evil Dead and Evil Dead 2. 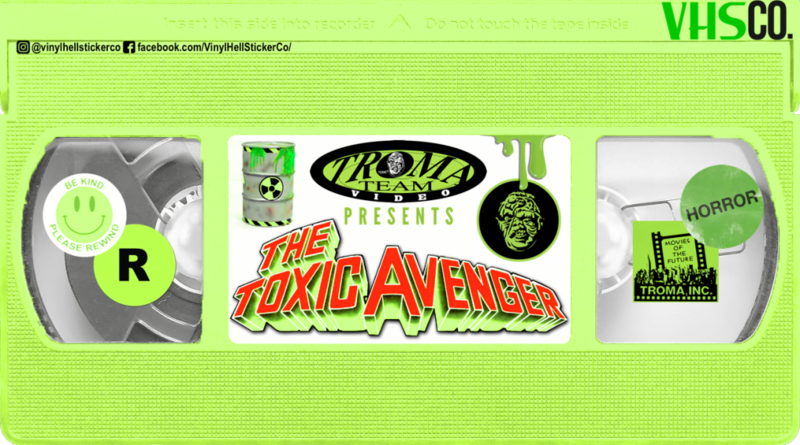 A Troma sticker (featuring The Toxic Avenger) is exclusively sold by Troma Studios (the first company sticker to be officially sanctioned by a movie studio). Troma will be featuring the sticker at conventions, so keep on the lookout for them. 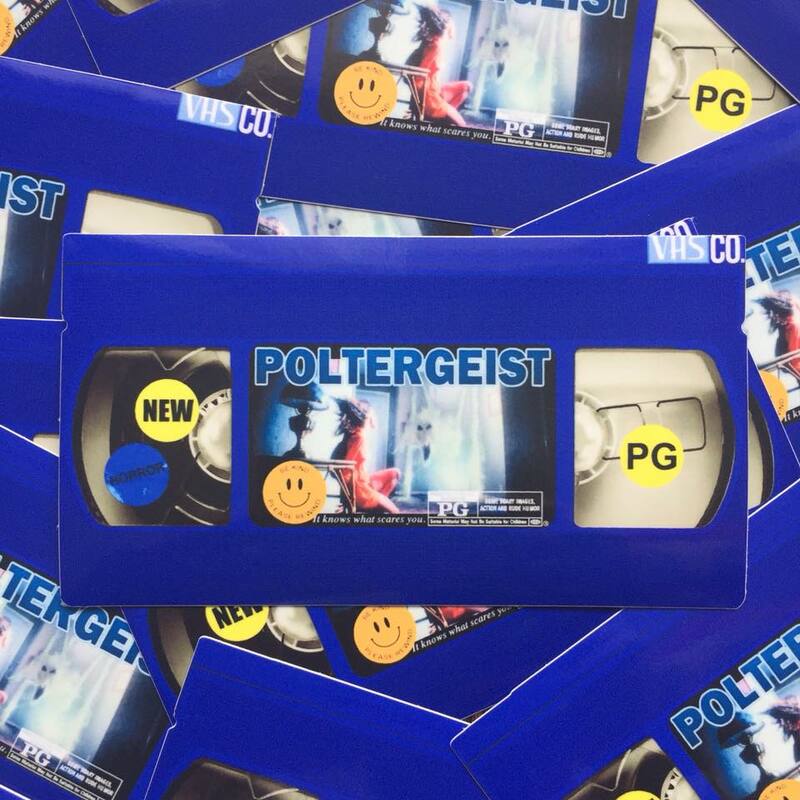 The durable stickers measure 5.16 X 2.84 inches (or 70% of an actual VHS tape) and are priced at $4 per sticker with bundle combos available (3/$10, 8/$20 or $35 for the entire Volume II run of the unlucky 13 currently available.) There are 50 pieces per style of sticker available and once they’re gone, they’re gone (commissions and exclusive designs available). Grab yourself a handful of horror stickers at Vinyl Hell Sticker Co. on Facebook and send them a message (they do accept PayPal or eTransfer) (within Canada).